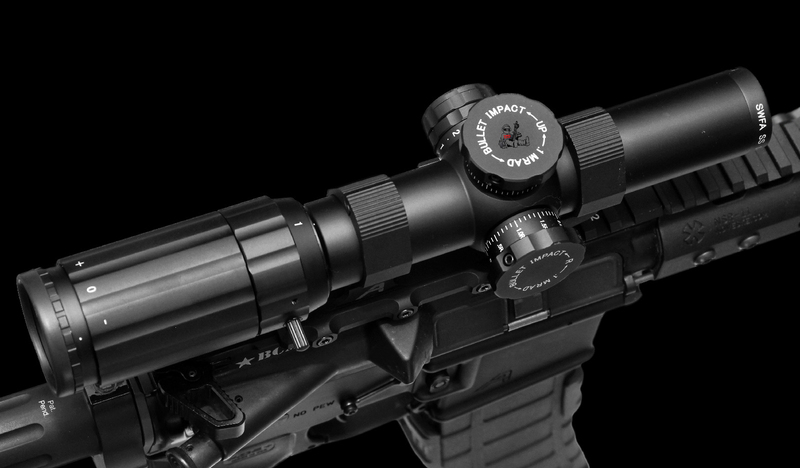 According to SWFA's product page, The new Illuminated Mil-Quad DM Reticle has built in aiming points for 100, 200, and 300 yards for most 5.56 and 7.62 rounds. I purchased this optic direct from SWFA when it came out for the listed price. 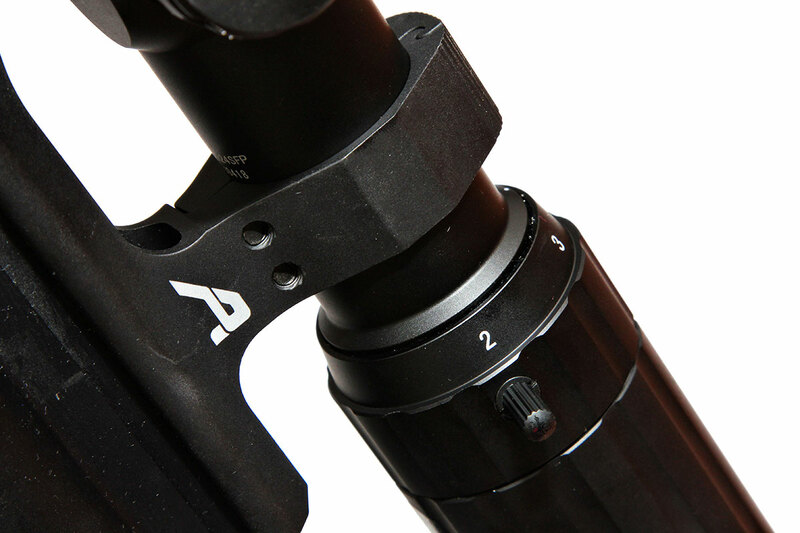 According to Aero Precision's product page, the Ultralight 30mm extended scope mount is made out of 6061 T6 extruded aluminum construction, the rear ring is pushed forward 1" for better eye relief and weighs around 3.27oz. I purchased the optic mount, used, for about half the price. I had reviewed and sold the Leupold VX-R 1.25-4x optic, so I was in the market for another 1-4x type optic to use and review, thankfully Black Friday sales never disappoint in the gun industry. I saw various posts on several forums about this optic and figured I would give it a try. The diamond reticle immediately caught my eye as being not very new, but having a new take on implementation of that type of reticle. You are probably looking at that reticle and all the stuff on it and thinking, well what does it all do? 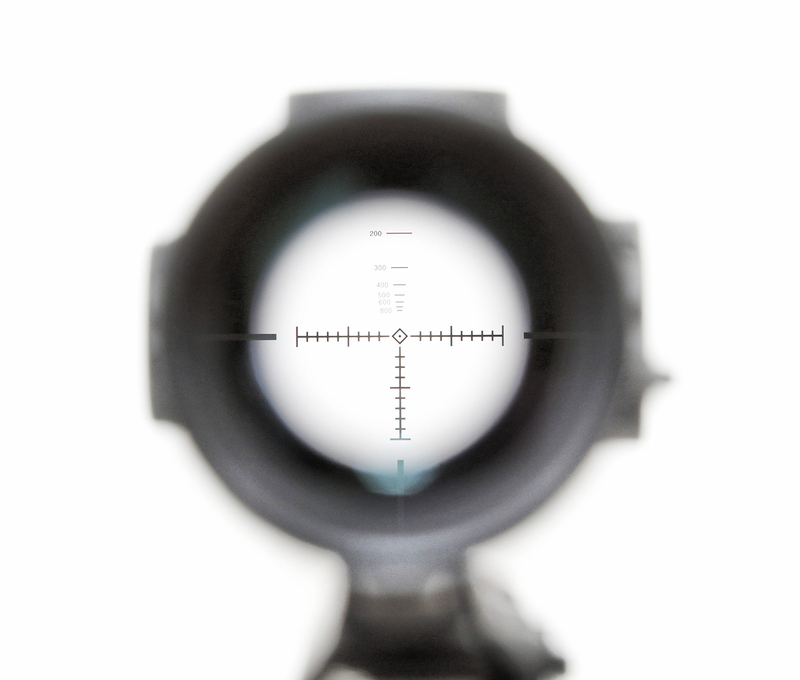 Check out this thread on opticstalk.com which has a bunch of different graphics that explain exactly what the ranging function of the SFP reticle does. I purchased the Aero Precision Ultralight 30mm extended mount specifically because I wanted to try a different company for an optics mount. Since I already had several products from Aero precision (several lowers) I figured the very sleek looking mount was worth a try. I first put the optic on my 11.5 BCM and hit the range to zero it. Per the instructions, the top tip of the diamond needs to be zero'd at 100 yards, in order for the optic to have a 200 yard hold on the center dot and a 300 yard hold on the bottom tip of the diamond. I used M855 to zero the optic (since it has data with the optic and that round available) and had no issues doing so. The turrets were very easy to use. They had very positive feedback per click and once I got the optic zero'd I used the provided small hex wrench and set the turrets to zero. 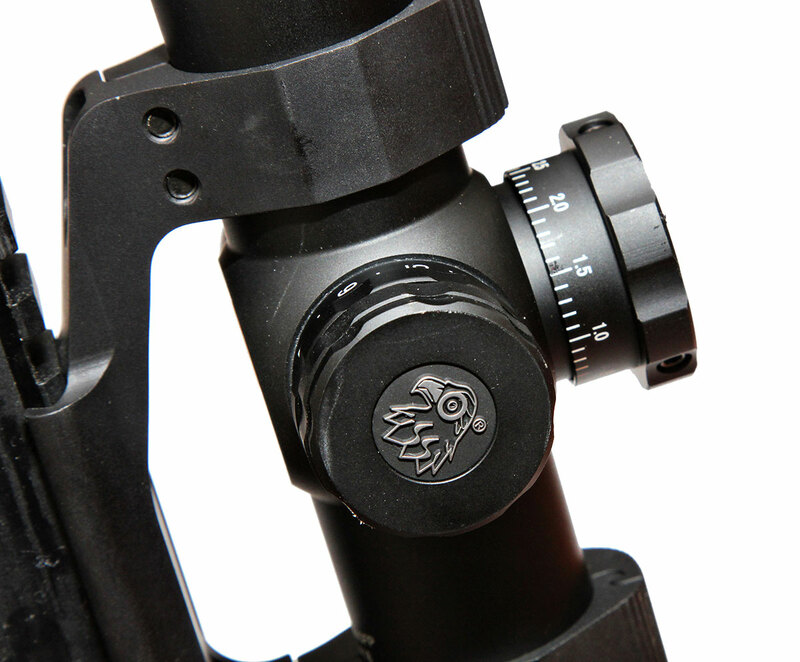 The optic is illuminated, red dot style, with the turn of the left most turret with the SWFA logo on it. I will say that I was underwhelmed with the difference between the settings. 7-10 were nearly identical and 1-4 were nearly identical, at least to me. I kept it on around 7 for daylight use at an outdoor range and around 4 for indoor use. The diamond reticle and the center dot all lit up, this is sort of annoying and something I personally do not like since on quick acquisition of reticle on target, especially while moving I have a tendency to either pick up the center dot or a rough estimate of the entire lit red reticle. I had a similar issue with the Burris MTAC that I owned years ago and sold because of it. The glass is very clear, I compared it to the only two variable optics I had on hand at the time, a USO 1-8x and a USO 1-4x. 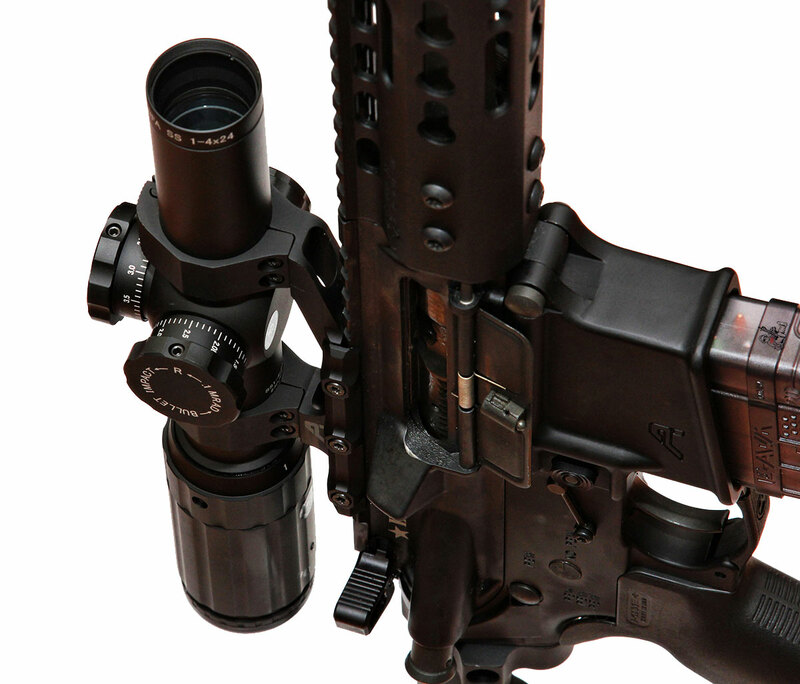 The glass was not as clear and vivid as the USO's, obviously, but it was as good as the Leupold VX-R's in my opinion. The USO's did not have any vignetting at the edges at magnification and have much better eye relief. The Aero mount was very easy to setup. I used some blue loctite and an Arisaka Defense leveler device and install was a breeze, no tricks or weird setup required. It held zero once set. I did a good bit of indoors training with this optic, room clearing and did some range work with it as well. 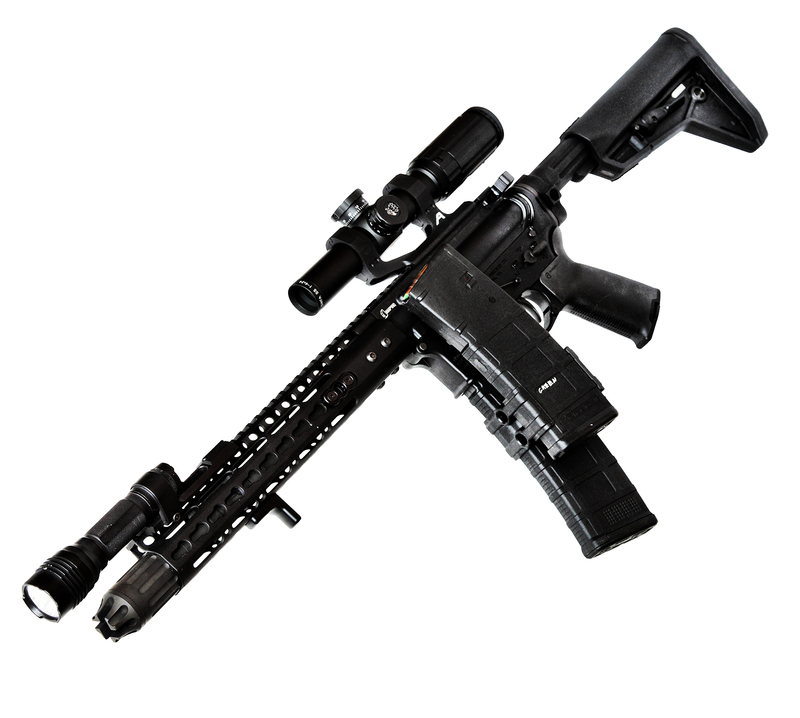 I fired at least 800 rounds through the BCM 11.5" upper'd AR pictured above with the optic attached. I will say that at 4x magnification you really need to make sure your stock position is correct, it is not as forgiving as the Leupold I previously review or the USO's I have. At 100 yards and in, using it at 4x is almost impossible on the move. You may get off a good shot or two stationary but doing anything while moving (especially versus a moving target) you are going to have issues. At 1x for 100 yards and in it's pretty easy to use. The reticle is nice and clear, easy to pick up on a target. As I stated before picking up the right aiming point on the diamond reticle is difficult while on the move or quick target acquisition. I found myself having to focus off the target and onto the specific tip of the reticle's top of the diamond to make effective hits. I know that there is always the argument of open turrets having issues of being knocked around and getting off zero resulting in the user having to manually adjust the turret back to zero. I did not have that issue with this optic. Once I set it, I forgot about it. I had the rifle in various positions through various training sessions and transported it in different types of cases (soft and hard). I ended up taking the optic off of the 11.5" BCM and putting it on a 10.3" DD barrel build I put together. I only had it on there for a little bit just to try out, I felt as though the optic did not mesh well with the 10.3" barrel so I removed it. I did not use the range estimation part of the reticle at all, not even once. Granted I was not shooting at people or animals during the training sessions so you will have to google other reviews for use of the ranging function. I did use the optic in various non-standard firing positions, prone/urban prone, left/right handed transitions for clearing/pieing corners and under vehicle/tire aiming, only issues I found were at maximum magnification. You really have to be on the optic in order to get a good sight picture at maximum magnification. At 1x there is no real issues. As most variable optics the 1.1-3.9x range is really a non-use, it is there, sure, but I never saw a need to use it in anything I was doing. One of the coolest and most unique features of the optic is that it comes with a built in adjustable length cat-tail. It has a short, medium and long tail. I opted to keep the short tail on there since I do not like pointy things sticking out off my rifles catching on kit. It worked really well, as well as can be expected. It never came loose and never had an issue being caught by a finger or part of hand to switch magnification smoothly. 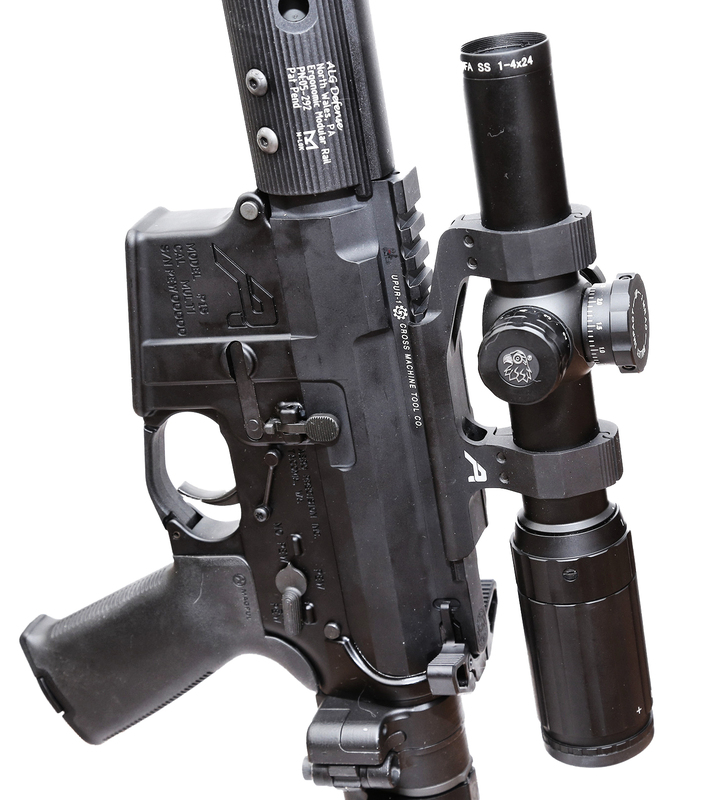 I like a lot of the features of the SWFA SS 1-4x and the Aero Precision Ultralight 30mm Extended scope mount. For a $400 optic you get a lot of bang for your buck. 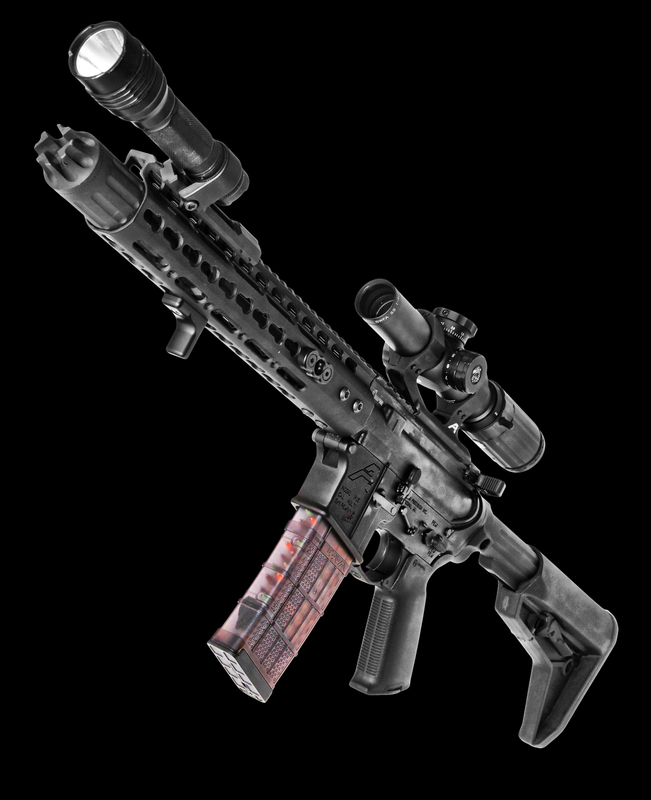 The features are plentiful and would provide the average shooter a great platform to learn on and eventually upgrade to a more robust and tactically efficient optic. I like that SWFA listened to the market (read; the end users) and gave them various features. 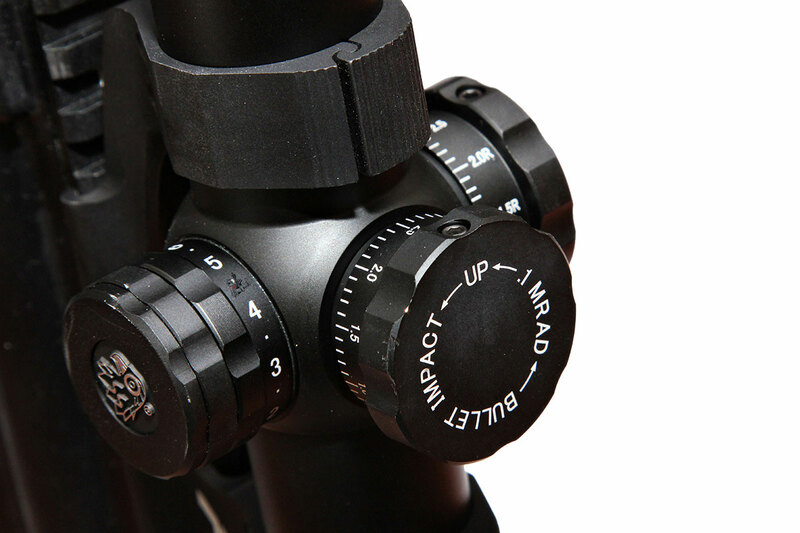 I believe that in order to properly use the ranging features on the reticle you really need to understand how it works and possibly have the manual close by to reference the distance measurements. It is not a look and see type of estimation like the H27, it is an estimation reticle that requires guessing of a persons or animals size at distance based on averages. Sure it may work for some and may not work for others. 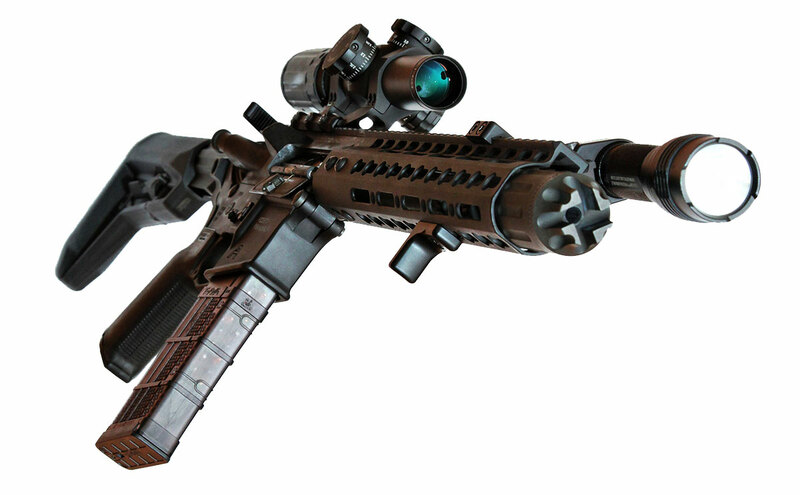 Good idea I guess, but I would say that having actual practical/tactical application is pretty minimal. I do give it points for clearness of glass, especially at 1x. It is nearly 1:1 and provides a good RDS-style platform with the added benefit of magnification on demand for $400, difficult to beat. The other serious issue I have is the reticle illumination. The diamond lights up, the center dot lights up, and you do not know which is the right hold without actually looking at the reticle while aiming, it gave me an issue. Some people do not have this problem, great for them. I would have been content if there was just illumination on the center red dot and the 100 yard zero was at the tip of the dot. Turrets are MRAD and adjustments are in .1 MIL, seems to work fine for zero, I did not do any type of adjustment for range or anything like that so I cannot make statements to its effectiveness. 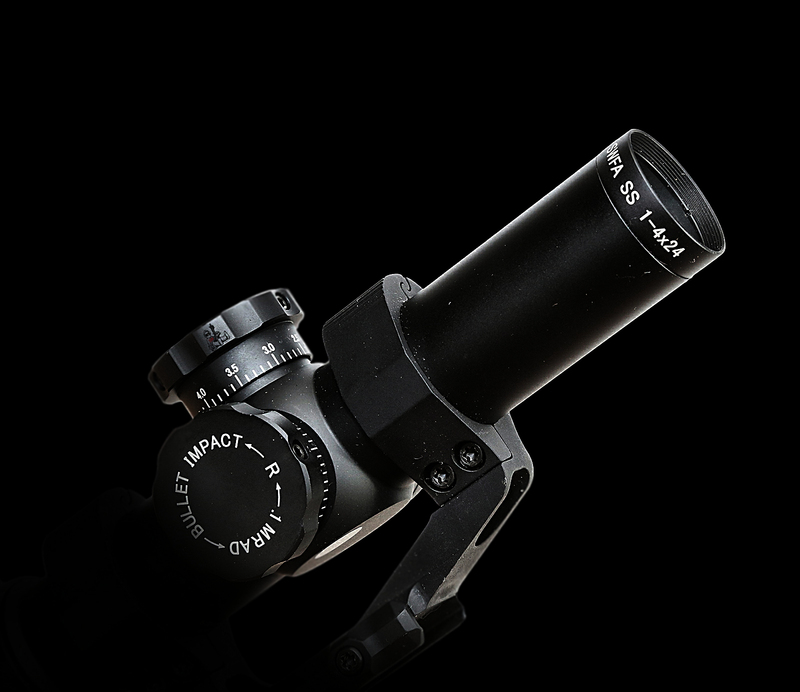 If you are looking for a cheap 1-4x optic, this is probably a good bet, especially if you are working on building up to a more expensive optic (like a USO or a higher end Leupold). The Aero Precision mount has no issues. 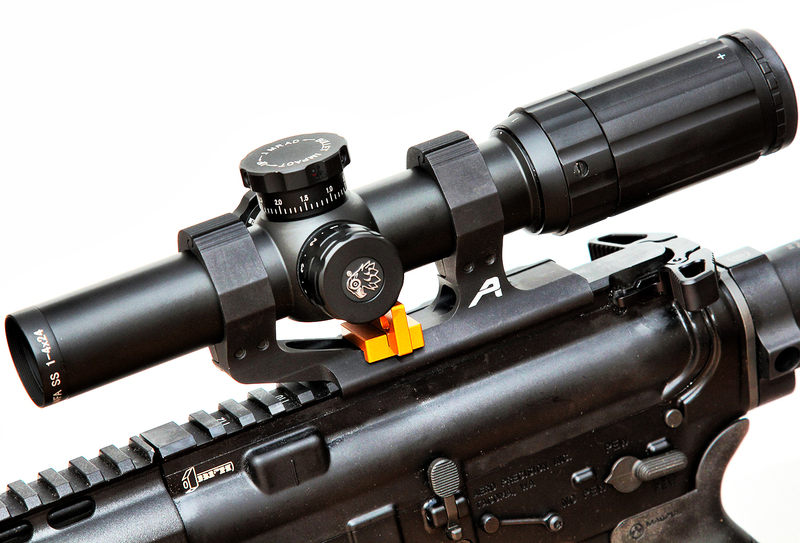 I would just say that you take your time when you torque the optic to the rings and the mount to your upper. I'd also mark the bolts to make sure they are lined up properly just in case you have future zero issues.